“Jack the Ripper. The most notorious unidentified serial killer of the world. Rivers of ink have and will continue to flow in the wake of this murderer and the legend behind the mysterious figure will continue to inspire plenty of non-fiction and fiction books.” This is the introduction I wrote for my review of Sarah Pinborough’s excellent “Mayhem” and a little over a month after the virtual ink dried on the equally virtual paper of my review one such title sprang forth. I find nothing wrong with the situation, after all the mystery of Jack the Ripper fueled plenty of my dreams ever since I first laid my eyes on his story. Nowadays not as much as in my childhood years, but it still keeps me very interested in the subject. 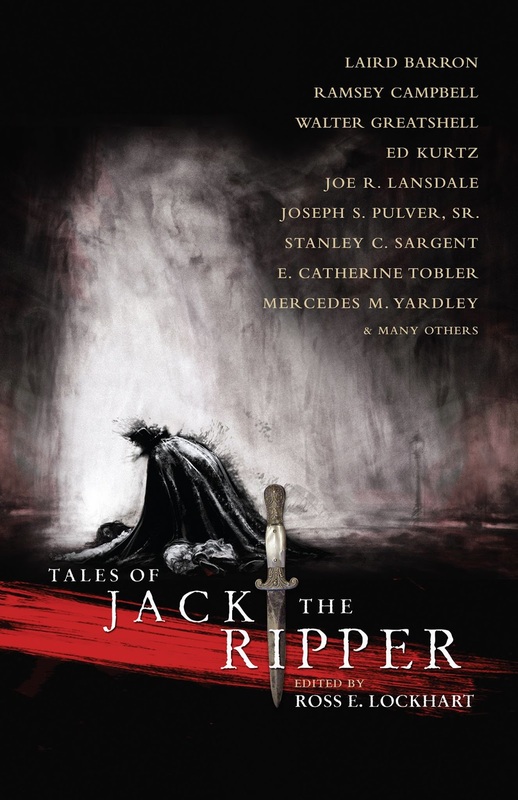 Therefore I received with delight the news of an anthology edited by Ross E. Lockhart dedicated to the notorious, mysterious serial killer, “Tales of Jack the Ripper”. 125 years after the Whitechapel murders started, Ross E. Lockhart gathers 19 new and classic stories of Jack the Ripper from some of best writers of dark fiction, including E. Catherine Tobler, Silvia Moreno-Garcia, Ramsey Campbell, Joe R. Lansdale, Laird Barron or Joseph S. Pulver, Sr. Besides the theme and attractive presence of these talented writers “Tales of Jack the Ripper” comes with other tempting promises for me, the full satisfaction I had with Ross E. Lockhart’s work at the two “The Book of Cthulhu” anthologies published by Night Shade Books, the atmospheric and excellent cover artwork made by Arnaud de Vallois and the chance to encourage a newly born small press, Word Horde. Even a single one of these features would have been made me interested in “Tales of Jack the Ripper”, but with all of them together I can’t wait to put my hands on a copy of Ross E. Lockrat’s new anthology. “Tales of Jack the Ripper” will be released this fall, but if like me you believe that date to be a bit too far away please consider grabbing Sarah Pinborough’s “Mayhem” I already mentioned, it is not about Jack the Ripper but it is set around the Whitechapel murders and captures perfectly the atmosphere of those Victorian times. 1888: One hundred and twenty-five years ago, a killer stalked the streets of London’s Whitechapel district, brutally–some would say ritualistically–murdering five women (that we know of): Mary Ann Nichols, Annie Chapman, Elizabeth Stride, Catherine Eddowes, and Mary Jane Kelly. The story of Jack the Ripper captured lurid headlines and the public’s imagination, and the first fictionalization of the Ripper killings, John Francis Brewer’s The Curse Upon Mitre Square appeared in October of 1888, mere weeks after the discovery of Jack’s first victim. Since then, hundreds of stories have been written about Bloody Jack, his victims, and his legacy. Authors ranging from Marie Belloc Lowndes to Robert Bloch to Harlan Ellison to Roger Zelazny to Alan Moore have added their own tales to the Ripper myth. Now, as we arrive at the quasquicentennial of the murders, we bring you a few tales more. From Word Horde and the editor who brought you The Book of Cthulhu and The Book of Cthulhu II comes Tales of Jack the Ripper, featuring new and classic fiction by many of today’s darkest dreamers, including Laird Barron, Ramsey Campbell, Ed Kurtz, Joe R. Lansdale, Joseph S. Pulver, Sr., Stanley C. Sargent, E. Catherine Tobler, and many more. “Juliette’s New Toy” by Joseph S. Pulver, Sr.